Such fifid language,” Dr. Tchernikovsky observed. I’d sought out Dr. Tchernikovsky after a nearly sleepless week of a recurring nightmare in which I’d reverted to my army days. Except that instead of being dressed in my IDF fatigues, I had on a scratchy bronze helmet and a cuirass a size too big for me. Something heavy, large, and uncomfortable was strapped to my left arm, and my right hand gripped something long and hard. Yes, that’s what I thought, too, but when, in the morning, I pieced together the other details of this nocturnal horror show it didn’t seem to fit the standard Freudian typology. It was very dark, I was thirsty and horribly cramped, and the meager air smelt of timber mixed with flatulence. Dr. Tchernikovsky placed his elbow on the armrest of his overstuffed chair and stroked his soup-strainer mustache, staring hard at me, as I lay stiffly on his analyst’s couch. In my dream, something cold and sharp touched me. “Hey! Watch that!” I hissed. I heard the sound of muffled cheering and we began to move, bouncing up and down like we were being trundled over a rocky field. There was a loud creaking sound, followed by a slam. We rode a little farther, the cheers continued for a while and then faded away. An hour went by and then I felt fresh air on my face. “Diamanti!” Pyrrhus (also called Neoptolemus) shouted. “You vill please tell me vat you haf been reading,” he repeated sternly. “Well, last week I finished Amir Gutfreund’s latest novel, When Heroes Fly,” I said. “I haf not had de prifilege of reading it,” he said dismissively. Each centurion was leading his men in a quick set of leg and arm stretches. I realized in a panic that, while I’d been trained to fire a semi-automatic rifle, an RPG anti-tank rocket launcher, and a 60-mm mortar, I hadn’t the slightest idea how to deploy a sword and shield. “Charge!” Pyrrhus shouted, and the men immediately jumped to their feet and followed their officers off into the city around us. I followed Pyrrhus up a broad stone-paved avenue that ascended toward a huge and beautiful building. “No, of course not,” I scoffed. Then it rosy-fingered dawned on me. “Get that sword arm going, man!” Pyrrhus barked at me, adding some juicy expletives of the type that I cannot repeat in this tribal magazine. I looked around me. The palace floor flowed with blood. Guts were spattered over the walls. Trojan screams filled the air. Pyrrhus halted in mid-thrust, just as he was about to run his spear through a princess and her baby. In the midst of the mayhem around us, he held his arm there for a full minute or more. Then he turned his sweaty face to me. Pyrrhus was pursuing wounded, bleeding Polites, son of King Priam of Troy, through the palace corridors, and I was hot after him. “Such fifid language,” Dr. Tchernikovsky observed. “Go on,” he encouraged me. ‘You!’ he cries, ‘you and your vicious crimes! grant you the thanks, the rich reward you’ve earned. Pyrrhus was about to slaughter Priam on his own altar. But I couldn’t keep myself from asking the old man a question. “So you see,” Dr. Tchernikovsky said. I looked down and saw welts on my shield arm and calluses on my sword hand. 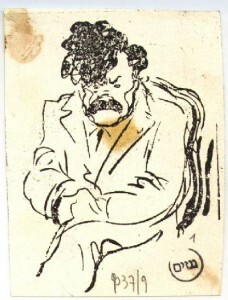 The drawing of Shaul Tchernikovsky comes from the website of the Gnazim Archive.